The KC BBQ Experience: Old-school cool meets modern renaissance for Kansas City’s signature cuisine. Meet the Makers: KC’s makers are crafting more than just high-quality goods—they’re building community as well. Date Night: Find inspiration for a romantic rendezvous beyond dinner and a movie. KC Distilled: Raise a glass to Kansas City’s booming distillery scene. Neighborhoods to Know: Local pockets of entertainment, food and culture to drive your KC adventures. Get instant access to the Visit KC magazine by viewing our digital version. The digital version offers you the full experience of the print magazine using your browser. Published every March, it is the only local guide sent to visitors prior to their trip, and also is available for free in local hotels, visitor centers, convention venues, Missouri welcome centers and other local attractions. Click below to fill out the form and your copy of Visit KC should arrive in four to six weeks. The Kansas City Official Visitors Guide app transforms the print magazine into an interactive experience. Custom built for the iPad, this sleek and exciting app takes users on a virtual journey through Kansas City, Missouri. 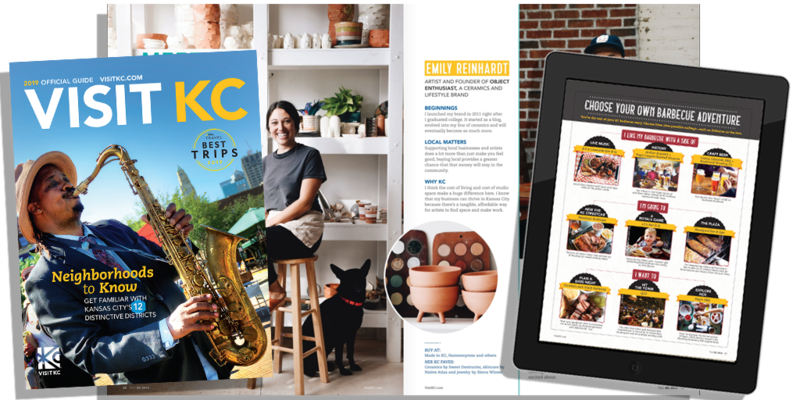 While picking up your copy of Visit KC, let the experts in the Visitor Center help you find the best there is to do and see while in KC.